It’s time for yet another December tradition here on MBIP! So far we’ve done the yearly December tattoo, the Fish House Holiday Drink Contest and our yearly Pause With Mr. Claus. Today we celebrate the anniversary of when I first met my friend, Amber Bohannan back when she was Amber Asher and then how we met again over two years later out of the blue. I love the story of how we became friends, although I think she’s sick of hearing it, but what are you going to do? Well I’m going to tell it again and here goes! Back in 2010 I was living in New York City and I had been doing a year long blog project of going to a bar 365 days in a row. You can read all about that project here. Since I had to go to a bar every day I had to schedule bars to go to when I came home to Peoria for the Christmas holidays. The most challenging date was Christmas because most bars close on that date here in Peoria. My brother Tom found a bar called the Last Chance Bar & Grill that was open on Christmas day, so that was my destination eight years ago. On Christmas day in 2010, armed with the 365 Bar Camera and joined by my brother Tom and my Dad, we drove to the Last Chance Bar & Grill. Everyone there was nice and played along as I took photos and did my 365 bar thing. She told me her name was Amber and she was friends with Justin Glawe, who I was supposed to meet me that day, but she told me that he couldn’t make it, so he asked her to come and meet me instead. Justin is a writer who at the time was doing a Peoria bar blog called The Peoria Bar Review. We had found each other online and planned to meet at the Last Chance and compare bar-blogging notes, but as I just wrote, Amber came in his place. When she told me that she had showed up in Justin’s place, I remember saying to her, “Well, you’re a lot prettier than Justin, so this is good news!” We laughed and went to the bar to have a beer and it was then that a funny thing happened. 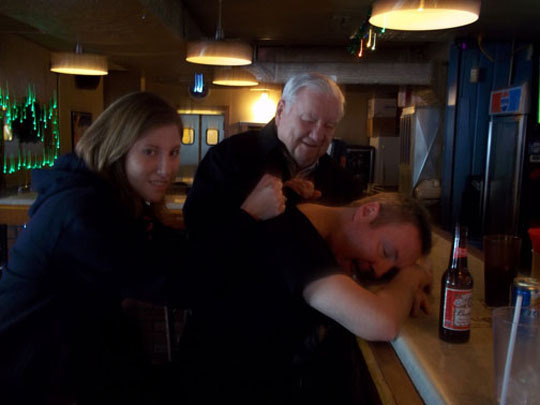 We both laughed sat at the bar and hung out and Amber ended up finishing up the day with us and here’s the final shot of her and my Dad trying to scrape me off of the bar that fateful day. And then life went on. I went back to New York City, finished my 365 bar blog, did two other blogs and worked my night job. Now we fast forward to over two years later. I moved back to Peoria in 2012 and you can read all about that time in my life here. My goal when I moved back here was to write and produce a fun Peoria blog and thanks to all of you who read this, it happened and life was rolling along. In October 2013 the MBIP blog was just about a year old when I stopped in to The Costume Trunk for this blog post. While taking pictures in there I saw a card that was advertising custom-made novelty teeth for Halloween that were being made at a local dentist office. I asked Steve about it and he said some people had stopped in and asked if they could leave the cards there and he said sure. I was intrigued and thought getting the teeth might be a fun MBIP post. The name of the dentist office was All Smiles and I called and spoke to a woman who told me her name was Danielle. I told her about the MBIP blog and how I’d like to get the novelty teeth and take some photos of the whole process and she told me to stop by so in a couple of days I did and you can see the post here. I met Danielle who was at the front desk. She was really nice and we were joking around when she said the words that brought a little bit of fear to me. “You know there’s a woman from your past that works here,” Danielle told me in somewhat ominous tones. “Well, I don’t know if that’s good news,” I somewhat jokingly said while clutching the MBIP Camera somewhat tightly. “Hey Amber, come on out here,” Danielle called out and Amber came walking into the front desk area. And then I remembered and we all laughed and I took the photo below of Amber in the office with Danielle in the middle and their co-worker Peggy on the left. Amber and I made plans to get a beer and catch up and we hung out a couple of nights later. Remember at the beginning of the story where I told Amber we were born to drink with each other? Well that came true and in the last five years we’ve had a ton of fun and good times. Along the way Amber met Joe and the two of them got married and both Amber and Joe have become two of my best friends. Every year around Christmas we go back to The Last Chance and celebrate the Amber Anniversary of when we first met and that’s what we did last night and here’s some photos from the festive evening! The Eighth Amber Anniversary Evening @ Last Chance Bar & Grill! Here we are at years later at the spot we first met, The Last Chance Bar & Grill. I love that neon sign on the side of the building. Let’s go in and let the anniversary evening begin! We settled in at a table and Tammy, our pretty and friendly waitress promptly delivered our drinks. I gave Tammy the MBIP Camera and took a photo of myself, Amber and Joe at our table in the back room. We placed our dinner order and then I got up and abandoned Amber and Joe to go take my MBIP pictures for the evening. Hey, it’s what I do! The Last Chance Bar & Grill is known for their extensive all-day, all-night breakfast menu as well as a large selection of burgers, sandwiches, wings and many other selections. You can check out the whole menu here. This is the kitchen in the back and an order is up and waiting to be delivered to a hungry patron. I took a shot of a couple of the cooks busy making the culinary magic happen back there. As you can see, the place is really busy tonight, that’s why we sat in the back. The bar has festive lights hanging over it. And I think this is the longest bar in Peoria! Just behind the bar area is another room with dining tables, a booth in the corner, pool tables, another bar and a smoking patio in the very back. This place has it all! Dinner is served! We got an order of the sweet chili wings, an appetizer sampler basket and a filet of fish sandwich with waffle fries. Everything was delicious! If you’ve never eaten here, you should definitely stop by and try it out. I thought it would be fun to start taking a picture of Amber in the very spot where I first took her photo in here with the 365 Bar Camera which is pictured at the top of the post. Here’s the 2018 photo and Amber looks even more beautiful than she did eight years ago! Thanks so much for coming out here eight years ago and starting up one of the best friendships of my life, Amber! Related Posts: Thirsty-Third Friday @ Jan’s Tap, Dozer Park and The Untamed Chef.